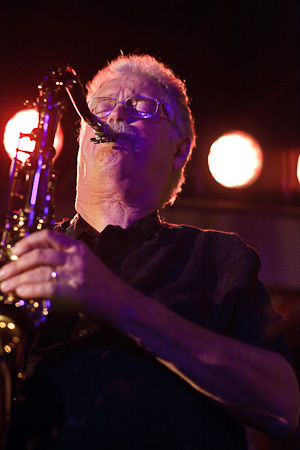 LA Saxophonist Pete Christlieb returns to the Seattle area next week and will be performing at Boxley’s in North Bend on Tuesday, July 31, at 7:00pm. Christlieb will be co-leading the group with longtime friend and fellow saxophonist Bill Ramsay. Rounding out the group will be Linda Smalls (trombone), John Hansen (piano), Chuck Deardorf (bass) and Greg Williamson (drums). So I’m packing for a sweet little trip to Aspen… I’ll be singing with the incomparable Christian McBride!!! Kendrick is performing in Aspen, Colorado, this weekend as part of a group led by bassist Christian McBride at Jazz Aspen Snowmass. After many weeks of no local jazz coverage in The Seattle Times, there are a couple stories in today’s paper. While this isn’t exactly covering the local jazz scene (aka local jazz musicians, local jazz clubs and day-to-day or week-to-week happenings), we’ll take what we can get. Michael Feinstein’s latest CD, “The Sinatra Project II: The Good Life,” is not, strangely enough, all about Frank Sinatra. It makes room, too, for a twisted, distinctly non-Sinatra ditty about the upside of making it through an “H-bomb” explosion. Why is the lone male survivor so happy? Because he has all 13 surviving women to himself. And where did “Thirteen Women,” the CD’s peppy opener, come from? From the B-side of Bill Haley and Comets’ hit “Rock Around the Clock,” by way of Ann-Margret (who recast it as “Thirteen Men”). Other items on Feinstein’s eclectic new recording also have strong associations with other singers. “Sway” belongs irretrievably to Dean Martin. “Once in a Lifetime” (no, not the Talking Heads song) was a signature tune for Sammy Davis Jr. Still, Feinstein’s tribute to Sinatra is evident in his covers of such classics as “The Lady Is a Tramp” and “The Way You Look Tonight,” along with lesser-known ballads, including “I’ll Be Around” and the CD’s title track (also a hit for Tony Bennett). When Feinstein brings his crackerjack 17-piece band to Benaroya Hall on Friday, he’ll perform songs from “The Good Life,” no doubt. One thing that was missed in this article is that Feinstein’s “crackjack 17-piece band” includes some of Seattle’s top-flight jazz talent including: Bill Ramsay, Thomas Marriott, Mark Taylor, Dave Marriott, Michael Barnett and others! Lewis opened a four-night stand Thursday and continues at 7:30 and 9:30 p.m. Friday and Saturday and at 7:30 p.m. Sunday at Dimitriou’s Jazz Alley, 2033 Sixth Ave., Seattle; $30.50 (206-441-9729 or www.jazzalley.com). Be sure and check out our preview of Jazz Port Townsend and Jazz In The Valley. This weekend features two big jazz festivals on each side of the mountains. 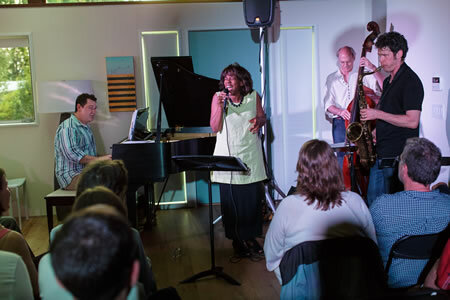 Starting tonight, Jazz Port Townsend kicks off with club performances and mainstage concerts by national and regional talent. 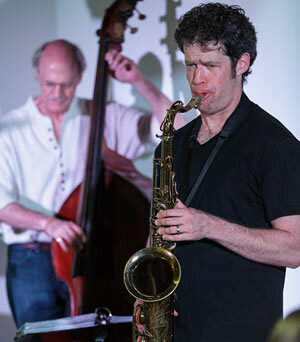 Performers this weekend include Eric Reed Trio, Benny Green Trio, with special guest Gary Smulyan, Dena DeRose, The Centrum Big Band performing the music of Johnny Mandell, Terell Stafford, Wycliffe Gordon, Matt Wilson and many more. You can also head East to Ellensberg for Jazz In The Valley which runs Friday through Sunday. The format is similar — mainstage concerts and jazz in the clubs — but featuring many of the top regional talent and the programming is a bit more adventurous. Performers include legendary Portland drummer Mel Brown, Total Experience Gospel Choir, John Moawad’s All-Star Big Band, QED Trio, Barry Bergstrom, Little Blue and the Bluenotes and more. If you are staying in town this weekend, you can catch the Stephanie Porter Quartet (Friday) and Peter Daniel Quartet (Saturday) at Tula’s Jazz Club and legend Ramsey Lewis will be at Jazz Alley. Seattle-Kobe Sister City Association is pleased to announce its 13th Annual Kobe Jazz Day on Monday, July 30, 2012. 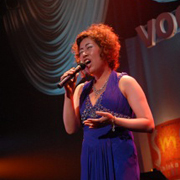 Please join us for an evening of jazz by Kobe Jazz Queen Contest winner, Ms. Yuko Ishida! Ms. Ishida will be making her Seattle (and US) debut at Dimitriou’s Jazz Alley on Monday July 30. 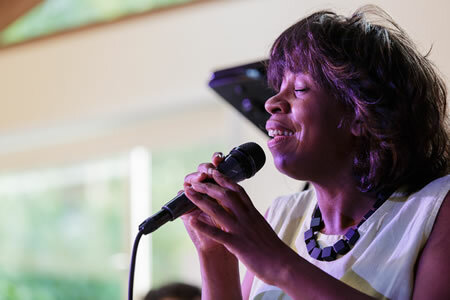 This past May, SKSCA sent local jazz vocalist Nancy Erickson and Meadowdale High School vocalist Taylor Zickefoose to Kobe to sing as guests at the May 2012 Kobe Jazz Queen Contest, and they will also be performing with Ms. Ishida at this event. This will be a special performance, as it coincides with Seattle’s 55th anniversary as Kobe’s sister city. The mayor of Kobe along with other members of the Kobe Delegation will be in attendance. Please come show your support for Ms. Ishida as well as our ongoing sister city jazz exchange program! The suggested donation is $5.00 for students and $10.00 for adults with proceeds supporting this event as well as future Seattle-Kobe Jazz events. Thank you to the sponsors of this event, which include: Dimitriou’s Jazz Alley, Kobe Trade Information Office, Sankei Travel, Seattle-Kobe Sister City Association, and Shinkaichi Music Street. Add this very fun event to your calendar and join us for dinner and song at Jazz Alley. Make your reservation online or by calling 206-441-9729. 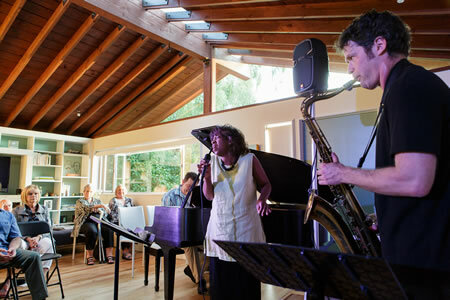 Anton Schwartz and his wife Dawn hosted another “Loft Concert” at his West Seattle house on Saturday night, this one featuring vocalist Gail Pettis. 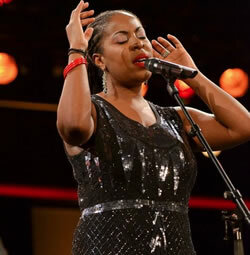 She was joined by Anton on saxophone, Jeff Johnson on bass, and Blake Angelos on piano. My big band Acquired Involuntary Narcissism returns, playing a set of new and not-quite-so-new original music and arrangements of songs by Elvis Costello, Bob Marley, and Johannes Brahms. Featuring the world premiere of a new piece from my suite of music inspired by Jorge Luis Borges! The band is Stuart MacDonald, Steve Treseler, Eric Barber, Jim DeJoie (saxes); Greg Lyons, Thomas Marriott, Al Keith (trumpets); Andy Clausen, Nelson Bell (trombones); Bill Anschell, John Silverman, Greg Williamson (rhythm). The Jovino Santos Neto Quinteto, featuring yours truly. We’ll be playing two sets of exciting original music by Jovino, Ben Thomas, and me. With Tim Carey (bass), Mark Ivester (drums), Jeff Busch (percussion). The Q.E.D. Trio (Alex Chadsey, piano; Chris Stover, trombone and congas; Ben Thomas, vibes, bandoneón, cajón) is playing at Jazz in the Valley, at J.J’s on Main. We’re working on music for a new CD release in 2013! I hope your summer is going well! Just a quick reminder that if you getting tired of the summer routine, come out to a show! Both of these are all ages at the Good Shepherd Center in Wallingford. MetriLodic will be opening on the Wayward Music Series for Burn List. Burn List is a new collaboration from Seattle’s scorching new music scene featuring trumpeter Cuong Vu, tenor saxophonist Greg Sinibaldi, keyboardist Aaron Otheim, and drummer Chris Icasiano. I will be playing in a large ensemble of Chris’. Chris is a fantastic trombonist, composer, and arranger. Playing some of Chris’ original material along with some great arrangements as well. The whole band will be packed with killer players and improvisers. 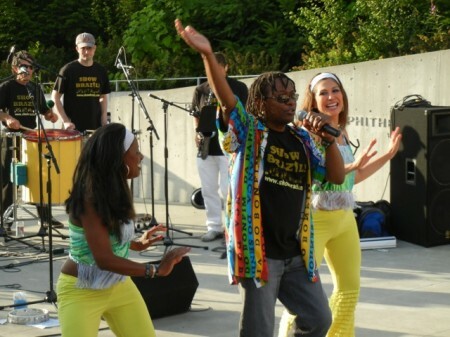 Exuberant Brazilian music and dance made for a perfect summer concert at the Seattle Art Museum’s Olympic Sculpture Park earlier this month when Earshot Jazz presented Eduardo Mendonça and Show Brazil for this month’s Art of Jazz concert. Seven musicians and three dancers, plus audience participation provided additional reasons to celebrate summer in Seattle at the park on Elliot Bay. 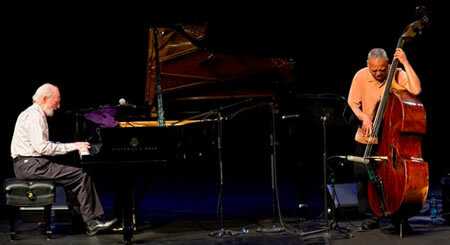 Excerpts from the concert will air on Jazz Northwest, Sunday July 22 at 1 PM PDT on 88.5 KPLU and will stream at kplu.org. This program also includes updates on the live jazz scene and a preview of next weekend’s Jazz Port Townsend, July 26-28. Jazz Northwest will be recording concerts at Jazz Port Townsend for future shows. Jazz Northwest is recorded and produced by Jim Wilke exclusively for 88.5 KPLU. The program airs every Sunday at 1 PM PDT and is available as a podcast following the broadcast. Washington, DC – Dizzy Gillespie. Count Basie. Ella Fitzgerald. Herbie Hancock. Names of the greatest purveyors of America’s homegrown art form, jazz-and all NEA Jazz Masters. Today, the National Endowment for the Arts adds four new names to the list with the announcement of the 2013 NEA Jazz Masters. Like the 124 honorees who came before them, these four individuals are recognized for their lifetime achievements and significant contributions to the development and performance of jazz.They will each receive a one-time award of $25,000. * Lorraine Gordon is the recipient of the 2013 A.B. Spellman NEA Jazz Masters Award for Jazz Advocacy, which is bestowed upon an individual who has contributed significantly to the appreciation, knowledge, and advancement of the art form of jazz.